In print and on the Web today, the Orange County Register has the happiest news on earth. 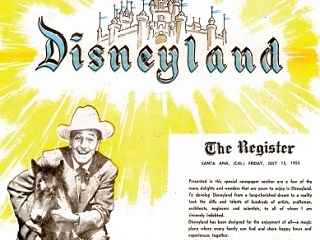 On the Web side, the Orange County Register has all kinds of goodies posted to commemorate today’s 60th anniversary of the opening of Disneyland in Anaheim, including a selection of wallpapers and a look at Walt Disney’s Main Street apartment. On the print side, the paper has doubled up. Above is the front page of a special 16-page section published by the Register on opening weekend, 1955. It has been reprinted and is free to seven-day newspaper subscribers (as well as Disneyland employees, all of whom are receiving a complimentary copy). Non-subscribers can purchase, while supplies last, the 1955 section reprint for $2 or the section bundled with today’s edition for $6.95. Another fun piece today collates memories from longtime theme park photographer Renie Bardeau. Below is the bottom portion of today’s Register front page. Happy diamond anniversary, Disneyland!